This is a copy of an article published in the International Encyclopedia of the Social and Behavioral Sciences, Second Edition, edited by James D. Wright. Elsevier, 2015. Please cite as: Deflem, Mathieu. 2015. "Anomie: History of the Concept." Pp. 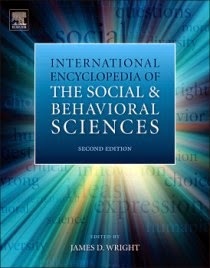 718-721 in International Encyclopedia of Social and Behavioral Sciences, Second Edition (Volume 1), edited by James D. Wright. Oxford, UK: Elsevier. Anomie is a term that, in various forms, originally appeared in writing in Greek antiquity and Biblical history. Introduced in modern sociology by means of an appropriation from social and moral philosophy at the end of the nineteenth century, the concept of anomie was first applied in the seminal works of Emile Durkheim. It was subsequently elaborated and examined in the context of the sociology of deviant behavior on the basis of the writings of Robert K. Merton. With varying levels of success, anomie has remained a mainstay in sociological theory and research until today. The meaning of anomie has thereby undergone several transformations of more and lesser conceptual significance. The term anomie dates back, in slightly differing linguistic forms, to Greek antiquity, the Biblical writings of the Old and New Testament, and late-19th century philosophy. As a scientific concept, anomie was introduced in sociology by Emile Durkheim and subsequently popularized through the writings of Robert K. Merton and other scholars working from within the tradition of structural-functionalism. Yet, Durkheim and Merton were not the only scholars to have developed sociological and other theories related to the term. Over the course of the development from classical to modern sociology, moreover, the concept has been used in a number of ways, both more and less distinctly related to the seminal works of Durkheim and Merton. A resurgence of the concept of anomie can be noted since the end of the twentieth century. As a result, in the contemporary sociology of the beginning of the current millennium, multiple understandings of the concept of anomie and related theories co-exist. The concept of anomie is not the invention of sociology, but is a term that has historically existed in various incarnations dating back to ancient Greece (Orrù 1987). Etymologically, the concept is derived from the Greek ‘anomia’, which, containing the root term ‘nomos,’ literally means a lack of law or, more broadly, deregulation and/or normlessness. As first introduced in Greek antiquity, the term refers to a factual state of affairs, denoting a lack of order, but also carries with it an ethical judgment of the undesirability of that condition. Thus, typical of a society’s culture that is as yet undifferentiated into scientific, ethical, and aesthetical realms, anomie was in the Greek tradition at once a descriptive and normative term, presenting both a rudimentary sociology and a philosophy of society. Specifically, Greek philosophy contained references to anomia during debates in the fifth-century BC, which, foreshadowing modern sociological debates on anomie, was a period in history marked by profound social changes and turmoil. Greek philosophers in the sophist tradition that was oriented at educating political leaders and members of the nobility differentiated at least three aspects of these changes in qualifying a person as ‘anomic’, referring to a lack of personal character (inhumaneness), a disregard for religious norms (impiety), and defiance towards the unwritten rules of traditional custom (injustice). The Greek term anomia was mostly referenced in its adjective form (anomos) to relate to an order of rules and norms broader and more fundamental than only formal laws. The social and ethical problems discussed were therefore of both a moral character and political in nature, affecting people’s dispositions and conduct as well as the social order in which human relations were organized. Anomia, in other words, was held to be a quality existing in people as well as in the order around them. A next important pre-sociological step in the development of the concept of anomie is its treatment in the biblical writings of Judaism and Christianity (Orrù 1987). The biblical usage of anomia was partly influenced by relevant Greek philosophical writings because it entered the biblical tradition when the Old Testament was translated into the Greek. Initially, the word anomia was used for about twenty Hebrew words, referring to various aspects of wickedness, ungodliness, injustice, wrongdoing, evil, depravity, transgressions, and sin. In the latter meaning of sin, anomia was used interchangeably with the Greek term ‘hamartia’ which refers to a fatal flaw. The biblical understanding of anomia gradually became more delineated in meaning to refer, not to individual shortcomings, but to a state of society whereby the forces of evil took control over and against the divine order during the last days of the world. This apocalyptic understanding of anomia bears some resemblance to the sociological notion of anomie Durkheim would introduce in the late 19th century as a counterpart to Karl Marx’s historical-materialist theory of alienation. A third understanding of anomie before the coming of sociology was represented in certain religiously inspired strands of Western philosophy, specifically in sixteenth- and seventeenth-century England, which developed a conception of natural law based on selected aspects of ancient Greek thought. This renaissance recaptured the Greek notion of anomia, which had mostly vanished during the Middle Ages, in legal as well as biblical writings by means of the Anglicized word ‘anomy.’ A perspective of natural law was thereby proposed in which the lawlessness of anomy was situated in opposition to an order that defended a sense of nature with implications for both the religious order and the social world. This understanding of anomy, however, was not successful in inspiring further developments of philosophical and social thought. Stripped of its religious connotations, a new theory of anomie would not be developed until the late nineteenth century. The French sociologist Emile Durkheim was the first to introduce the concept of anomie and a related theory of society into the discipline sociology, but he did not independently re-invent the term. Instead, Durkheim had discovered the concept of anomie first in the writings of his philosophical compatriot Jean-Marie Guyau (Besnard 1987; Orrù 1987). A prolific writer on moral theory, Guyau had written six books and an additional three manuscripts by the time of his untimely death at 33 in 1888. Guyau’s French-language concept of ‘anomie’ appeared in two of his books, dealing with religion and morality, and was directly derived from the Greek ‘anomia’, a term Guyau mentions explicitly in his writings. Interestingly, Guyau does not conceive of anomie as a sign of evil, but as the distinguishing quality of an epoch whereby the decline of religious traditions has brought about a continued individualization of morality and rules. Under conditions of freedom, a morally good social order can only mean the absence of collective order and obligation. When Durkheim reviewed Guyau’s work in the 1880s, he favorably commented on its ability to develop elements of a sociology of religion, manifested in Guyau’s observations on the decline of religious traditions over the course of history. But Durkheim refuted Guyau’s individualistic moral anarchism in favor of developing an understanding of anomie as being in contraction with a society’s morality, the foundations of which to Durkheim could only be social, not individual. Thus, in Durkheim’s sociology, morality is equated with social order, and any profound disturbance of the social order is captured under the heading of anomie. Durkheim discussed the concept of anomie in two main instances in his sociological work (Besnard 1987; Deflem 1989). In his 1893 book on the social division of labor, Durkheim (1893) defends the perspective, squarely oriented against Marx’s theory on the inherent contradictions of capitalism, that the division of labor under normal societal circumstances does not produce any negative outcomes. However, under exceptional circumstances, Durkheim argues, the division of labor that marks society as a whole produces pathological or anomic outcomes because and when, first, there are no regulatory bodies to oversee the process and direction of the division of labor and, second, the actions of such bodies are not pre-specified by a particular set of rules. Durkheim mentions three such instances of an anomic division of labor taking place: during sudden periods of economic crisis; when conflicts occur between labor and capital; and with the increasing specialization of the moral and social sciences. In these cases, there is either no sufficient regulation over social relations or existing regulations are not congruent with the degree of societal development. The underlying theoretical premise of this concept of anomie as deregulation is that in so-called organic societies, with which Durkheim refers to modern societies that are marked by a high degree of individualism and functional specialization, integrative mechanisms are needed to accomplish unity and order through an appropriate recognition of diversity. According to Durkheim, the central organ necessary to achieve this integration and avoid anomie is the government as it can formally administer all necessary laws for a national collectivity. In his seminal study on the social conditions of suicide, Durkheim (1897) also relies on a notion of anomie as part of a general theory of society which he develops to account for various forms of suicide as a social fact. Distinguishing different types of suicide at the aggregate level, Durkheim first differentiates altruistic from egoistic suicide to refer to suicides influenced by the two extreme conditions of social integration. Egoistic suicide results from an insufficiency or lack of integration, while altruistic suicide is brought about by an extreme excess of integration. The consistently higher suicide rate among Protestants as compared to Catholics is an example for the former type, while the higher suicide rate in the military as compared to civilian life is an example of the latter. A third form, anomic suicide, Durkheim explains on the basis of an absence or a weakening of social regulation. Under these circumstances of inadequate or ineffective regulation, the suicide rate is abnormally high because of the suddenness of the changes taking place, irrespective of whether those changes are perceives as beneficial or harmful. Examples include moments of economic crisis, divorce, and rapidly acquired political strength through military expansion. Underlying Durkheim’s concept of anomie is the theory that social rules are needed in order to limit human desires which otherwise would be insatiable. Therefore, according to Durkheim, society, which exists exterior to the individual, holds a favorable coercive force over the individual’s desires. Under exceptional circumstances, including both fortunate as well as unfortunate but always sudden moments of transition, societal constraints are not effective in regulating human conduct. Acute forms of anomie then ensue, raising the level of suicide to pathological levels. Additionally, Durkheim argues, that in some spheres of social life, specifically in the realm of the economy, an absence of regulation can be of a more chronic nature. In such cases of a materialistically driven lack of any restraint, the anomic suicide rate is consistently high. The type of fatalistic suicide that results from an excess of regulation, as a logical counterpart to anomic suicide, Durkheim considered only a theoretical possibility. Also, anomic conditions could according to Durkheim only be effectively dealt with by means of well-functioning corporations or professional groups that, positioned in between singular individuals and the whole of society, can take on important regulatory functions. Durkheim’s concept of anomie did not readily lead to develop a relevant strand of empirical research and theorizing, although the classic’s underlying theory of society was, of course, enormously influential in the further evolution of sociology in the modern era. Neither did a corresponding Durkheimian sociology of law and norms develop until more recent times of advanced sociological specialization. However, Durkheim’s concept of anomie would be re-introduced in modern sociology by way of the intellectually closely aligned emergence of American structural-functionalism and its attention towards social integration and regulation. The modern concept of anomie would thereby change in meaning and become associated more closely with the sociology of deviant behavior. Robert K. Merton performed the most valuable work to renew and popularize an interest in anomie when he developed a novel sociological perspective of deviant behavior. Merton’s initial version of this theory was published in 1938 at a time when the scholar was heavily influenced by Durkheimian thought while a student at Harvard (Merton 1938). That initial paper was a rather exploratory sketch of a theory on the social conditions of deviant behavior, which he subsequently presented in a more systematic fashion (Merton 1949), and elaborated with an additional chapter that was published, along with the theory’s mature version, in the 1957 edition and all subsequent versions of his influential collection of papers, Social Theory and Social Structure (Merton 1957a, 1957b). Merton’s theory of anomie is presented as part of a sociological approach to the study of deviant behavior. Merton developed this perspective with the manifest objective of producing a sociological theory that conceived of deviant behavior as the normal outcome of certain social conditions, rather than an aberration on the basis of a psychology or biology of criminal dispositions. Merton’s theory unfolds on the basis of a perspective of society that distinguishes between the cultural goals preferred in a given social context, on the one hand, and the institutionalized norms or legitimate means to pursue those objectives, on the other. This viewpoint is applied to the conditions that exist in the context of the United States, whereby, Merton argues, the predominant goal is individual success, especially in the form of monetary wealth, while the institutionalized norms in the American context value hard work, especially by means of education and employment. Merton additionally observes, on the force of corroborating empirical evidence, that the cultural objectives of American society are typically emphasized much more than the legitimate means to reach them, thus unsettling the equilibrium between goals and means. As a result of this disjunction, Merton argues that anomie or normlessness takes place in the form of a de-institutionalization of the legitimate means of society. Merton’s related, but otherwise distinct theory of deviant behavior explains the various modes of conduct that can take place under conditions of anomie (Featherstone & Deflem 2003). Merton maintains that anomic conditions place specific pressures on individuals in terms of their ability to adopt cultural goals and means, which varies according to their respective positions in the social structure. Several modes of adaptation are possible, the most common one being conformity, whereby both the goals and means of society are accepted. Other forms of conduct, however, are considered deviant (though not necessarily dysfunctional) and involve an inability to adopt culturally approved goals and/or institutionalized means. In the case of innovation, for instance, alternative and often illegal means are appropriated to attain the cultural goal of individual success and monetary gain, whereas the adaptation of ritualism implies a holding on to legitimate means even though the success goals are out of reach. Developing a related theory of opportunity structures (Marwah & Deflem 2006), Merton maintains that the likelihood of various adaptations is influenced by the extent to which individuals do or do not have access to legitimate means in pursuit of widely shared goals. Merton in this respect referred to economic as well as cultural and other relevant conditions of opportunity. It can readily be observed that Durkheim’s and Merton’s concept of anomie are not identical, as the former primarily relates to a society’s goals whereas the latter emphasizes varying opportunities of means. However, unlike Durkheim’s original notion, Merton’s re-introduction of the anomie concept in modern sociology brought about a veritable avalanche of research and theory, especially in the realm of the sociology of deviant behavior and crime in the post-World War II era, with several hundreds of articles and books devoted to the subject until the 1970s. Of special interest are efforts to measure anomie empirically and related attempts to extent the notion of anomie from describing a state of society to analyzing the conditions of individuals in anomic societies (Deflem 1989). Most famous among the attempts to operationalize anomie is a scale developed by Leo Srole to measure the subjective experiences of people exposed to the social condition of anomie. Because Srole was aware that this measure did not capture anomie as a social condition, but instead examined the attitudes and dispositions of individuals, he re-introduced the corresponding term anomia in a socio-psychological meaning. Relatedly, other modern sociologists who were influenced by Merton’s writings, but who were also conscious of a growing theoretical awareness to distinguish between macro and micro aspects of social life, likewise argued for the relevance of the psychology of anomie to conceptually differentiate the subjective experience of anomie from its objective conditions. With variable levels of success, and causing some unneeded terminological confusion, the term anomie was then substituted by, and/or interchangeably used with, anomia and anomy. In the present era, however, only the concept of anomie has survived. Besides the micro-theoretical readings of anomie, conceptually most interesting during the period of the dominance of American structural-functionalism was the effort by master-theorist Talcott Parsons to explore anomie within a broadly Durkheimian framework. In his first major work, The Structure of Social Action, Parsons (1937) explains the notion of anomie as central to Durkheim’s thought in revealing that the coercive force of society over the individual, unlike the physical force of nature, is moral in kind. This insight leads Parsons to develop, and argue for the gradually unfolding in Durkheim’s work of, a voluntaristic theory of action, whereby the human will is seen as central to the functioning of society. Anomie, conversely, denotes a breakdown of the hold of norms over individual conduct. In The Social System, Parsons’s (1951) second magnum opus, the concept of anomie is again introduced in a Durkheimian fashion, albeit it with explicit reference to a sociological theory of deviant behavior and social control. Critically responding to the writings of his former student Robert Merton, Parsons uses the concept of anomie to refer to a state of disjunction between expectations and reality, involving a breakdown of the social order in the form of an ineffective regulation of human conduct. Anomic forms of suicide and deviant behavior are the result of this state of anomie. Mechanisms of social control are then called upon to restore the social system. If social control is not successful, anomie may endure to the point where structural changes lead the way to a different collective order. With the decline of the dominance of structural-functionalist sociology during the 1970s, the concept of anomie had all but vanished from sociology, especially from the practice of social research where once it had gained a central place. However, by the late 1980s, as the vulgar criticisms against structural-functionalism had been scrutinized and at least partly overcome, the concept of anomie witnessed something of a resurgence that has lasted, and has even been strengthened, until this day. At least two currents can presently be discerned in contemporary sociological perspectives of anomie. First, the Mertonian concept of anomie has remained of considerable interest in contemporary criminology and sociology (Adler & Laufer 1995; Marwah & Deflem 2006; Passas & Agnew 1997). The attention has shifted, however, towards treating Merton’s contributions as a classic reference point, rather than a direct source of research, and towards the further exploration of Merton’s theory of deviant behavior rather than the theory of society, as comprising cultural goals and institutionalized norms, that Merton developed along with it. Thus, the attention has moved away from anomie theory towards strain theory, whereby the latter dimension is often explored in individualistic terms. An exception, adequately focusing on the structural dimensions of society that are central to Durkheim, Merton, and likeminded sociologists, is the perspective of institutional-anomie theory that focuses on the criminogenic impact of the relative lack of regulation of an unbridled free-market economy by regulatory institutions such as the family. Second, the concept of anomie has re-appeared in contemporary sociological discourses in a meaning that relates more distinctly to the concept Durkheim originally introduced. Some of these efforts are of a theoretical nature, but most are explored through empirical research. On a theoretical level, among the noteworthy re-introductions of anomie is the work of Jürgen Habermas, specifically his sociological theory of system and lifeworld. Foregoing a lengthy exposition of this theory of society, Habermas (1981) introduces a concept of the lifeworld that refers to the dimension of society where actors are meaningfully coordinated in their social relations through communicative action. Habermas posits that the lifeworld contains the three structural components of culture, society, and personality, which, respectively, serve the functional needs of cultural reproduction, social integration, and socialization. The problems that can occur with respect to these three functions Habermas describes as, respectively, a loss of meaning, anomie, and psychopathologies. This Habermasian understanding of anomie is thus closely akin to, and directly derived from, the concept as it was introduced by Durkheim. More elaborate than the odd theoretical elaboration of anomie in contemporary sociology are the many new lines of empirical research that have used the concept of anomie in recent decades. This new and still growing literature on anomie is oriented at describing and analyzing issues of deregulation, normlessness, and/or norm-ineffectiveness that have come about since some of the most major societal changes that took place during and since the end of the twentieth century, such as the fall of communism, the global spread of capitalism, and the diffusion of, and difficulties involved in implementing with, the ideals of democratic government. Particularly noteworthy are the instances of social research on anomie in the context of post-Communist Eastern Europe and along with the rapid modernization of China. In the European context, important societal changes relevant to the study of anomie are additionally brought about by the encroachment of the European Union and the high levels of immigration into the European continent. In the Chinese context, the co-existence of a still Communist political regime with a rapidly modernizing economy has been observed to have produced strains and discrepancies in the social system that bring about a form of disorder the concept of anomie can highlight. Finally, there are some, albeit it as yet few signs that the concept of anomie has gradually also begun to gain some new attention in other sociological studies, especially at the level of organizations. A veritable revival of anomie cannot yet be predicted at the present time. Adler, F, Laufer, W.S. (Eds), 1995. The Legacy of Anomie Theory. Transaction, New Brunswick, NJ. Besnard, P., 1987. L’anomie: Ses Usages et Ses Fonctions dans la Discipline Sociologique Depuis Durkheim. Presses Universitaires de France, Paris. Deflem, M. 1989. From anomie to anomia and anomic depression: A sociological critique on the use of anomie in psychiatric research. Social Science and Medicine, 29(5), 627-634. Durkheim, E., (1893) 1984. The Division of Labor in Society. The Free Press, New York. Durkheim, E., (1897) 1951. Suicide: A Study in Sociology. The Free Press, New York. Featherstone, R., Deflem, M., 2003. Anomie and strain: Context and consequences of Merton’s two theories. Sociological Inquiry, 73(4), 471-489. Habermas, J., (1981) 1987. The Theory of Communicative Action, Volume 2: System and Lifeworld: A Critique of Functionalist Reason. Beacon Press, Boston, MA. Marwah, S., Deflem, M. 2006. Revisiting Merton: Continuities in the theory of anomie-and-opportunity-structures. In Deflem, M. (Ed. ), Sociological Theory and Criminological Research: Views from Europe and the United States. Elsevier/JAI Press, Amsterdam, pp. 57-76. Merton, R.K., 1938. Social structure and anomie. American Sociological Review, 3, 672-682. Merton, R.K., 1949. Social structure and anomie: Revisions and extensions. In Anshen, R.N. (Ed. ), The Family: Its Functions and Destiny. Harper, New York, pp. 226-257. Merton, R.K., (1957a) 1968. Social structure and anomie. In Merton, R.K., Social Theory and Social Structure. The Free Press, New York, pp. 185-214. Merton, R.K., (1957b) 1968. Continuities in the theory of social structure and anomie. In Merton, R.K., Social Theory and Social Structure. The Free Press, New York, pp. 215-248. Orrù, M., 1987. Anomie: History and Meanings. Allen & Unwin, Boston. Parsons T., 1937. The Structure of Social Action. McGraw Hill, Boston, MA. Parsons, T., 1951. The Social System. The Free Press, New York. Passas, N., Agnew, R. 1997. The Future of Anomie Theory. Northeastern University Press, Boston, MA. See related writings on sociological theory. "anomie theory" "anomie definition" "anomie definition sociology"